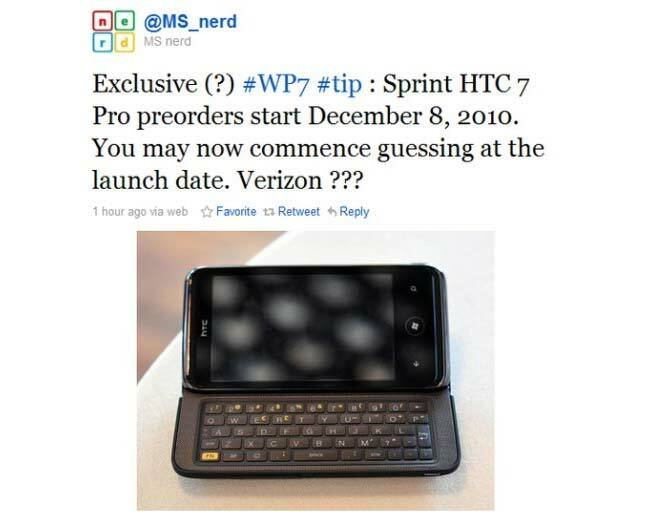 HTC 7 Pro Windows Phone 7 Headed To Sprint December 8th? It looks like Sprint may be launching its first Windows Phone 7 smartphone on the 8th of December, according to recent rumors. It seems that the HTC 7 Pro will be Sprint’s first Windows Phone 7 handset. The other day we told you that Microsoft was giving away 89,000 Windows Phone 7 devices to its employees, and it seems according to the BGR, that the employees are now able to pre-order the HTC 7 Pro, so we suspect it shouldn’t be very long before it goes on sale to everyone. Also the HTC 7 Pro recently got FCC certification, which is always a good indication that the HTC 7 Pro should be available soon. As soon as we get some more information we will let you guys know.